Obviously I wiped this blog and haven't posted anything in it in a very long time. To be honest, I'm still not sure if I'm going to keep this blog up, or if maybe I want to come up with a new name. But right now I'm just too excited. I'm getting a van! I'm equal parts nervous and excited about it. It's an old beast at the ripe birthyear of 1994. It's not my normal Ford. I've owned almost exclusively Fords up until now. It's a Dodge B350 15 passenger with a raised roof. 119k miles. It does have rust issues and I'm hoping there aren't even bigger rust issues that I didn't notice. I still have to go pay the man the money and pick it up hopefully in the next few days, but it's only about 15 miles away and was a local craigslist deal. Funny enough, I got a call from West Yellowstone, Montana last night 10 minutes after I emailed the guy my offer on the van. I have a phone interview for a position for the summer with them next Tuesday. This timing seems too intense to be a coincidence. 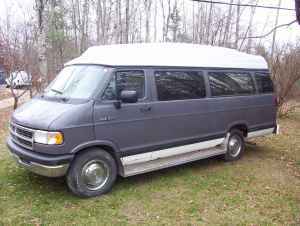 Here's a craigslist picture of the van! The family that I'm buying it from calls it Moby. I'm not really one to name vehicles or actually use the names I come up with but Moby is just the perfect name for this thing and I think the name will stick. It used to have a wheelchair lift in the back but they took it out. They seem to be some sort of foster family or something and have multiple children with disabilities. Really nice people. I have yet to meet the husband face to face but he seems like my grandpa in the fact that under the hood he has little stickers telling when he did such and such repairs to the van.